Précis: The goal is to present a brief synopsis of some of the neurodegenerative disorders, that is the easy part. The hard part is realizing that each of these diseases are progressive (either slow or fast), treatment strategies vary in success (from good to not really effective), and the most difficult/serious fact is that none have curative by their name. Saying these things, I still believe that we are approaching a turning point in our understanding of neurodegenerative disorders; treatment strategies are improving, and there are many clinical trials underway. I hope that anyone with a neurodegenerative disorder will try to remain positive because the pace/advance of science is accelerating, not retreating. Please stay informed and please stay hopeful. What are neurodegenerative disorders? There are hundreds of disorders that afflict the nervous system. Neurodegenerative disorders are diseases that primarily modify brain neuron cells. These disorders are characterized by progressive nervous system dysfunction. Neurons are key components on the central nervous system (CNS), which include the brain and spinal cord. 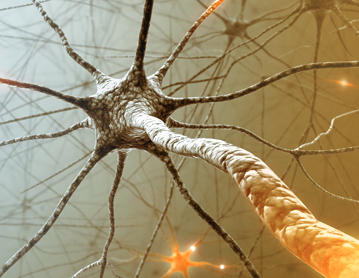 Unlike some other cell types in our body, once damaged or killed, neurons are incapable of repair-renewal. To date, neurodegenerative disorders have been incurable. 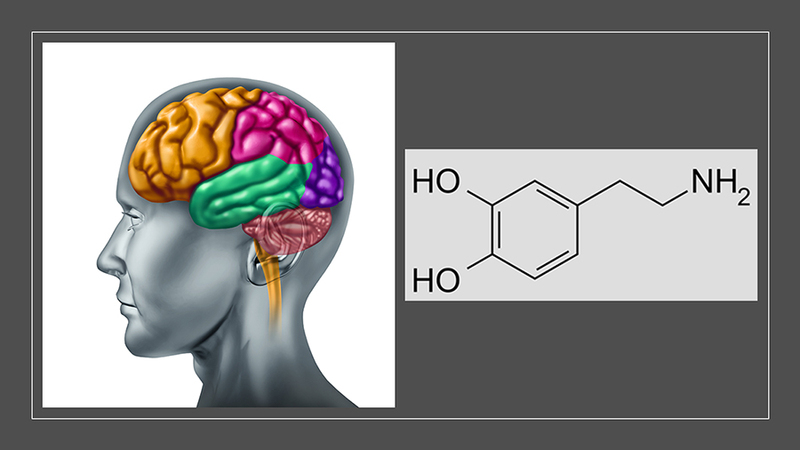 With time, they result in progressive damage/death of neurons in brain tissue. This will lead to difficulties either with movement (ataxias) or with mental functioning (dementias). Neurodegenerative disorders can modify several of our body’s activities, including: balance, movement (walking, gait), tremor, talking, swallowing, digestion, sight, hearing, breathing, and heart function. Scientists and physicians are working out the genetics, biochemistry, etiology (the cause of a disease), and pathogenesis [chapter and verse (i.e., story) of how a disease develops] of neurodegenerative disorders. Neurodegenerative disorders are caused by genetic alterations (inherited from parents), pathogens/environmental factors (toxins, viruses and chemicals), and many times, the cause is unknown. Depending on the specific disorder, neurodegenerative disorders can be either serious or life threatening. Therapeutic options (including physical/occupational therapy and CAM) are available to help improve some symptoms, deal with some cognitive/psychiatric issues, relieve pain, and increase mobility. Alzheimer’s– Alzheimer’s has its genesis in the hippocampus, the region of the brain critical for memories and spatial navigation. Alzheimer’s typically presents with cognitive/dementia issues (and eventually even the ability to carry out simple tasks). Beta amyloid-Aβ and tau precipitation lead to neuronal cell dysfunction. Alzheimer’s is the most common cause of dementia in the USA. Amyotrophic Lateral Sclerosis (ALS)– Amyotrophic lateral sclerosis (in the USA commonly referred to as “Lou Gehrig’s Disease”) is a motor neuron disease. ALS results in the selective loss of motor neurons. Motor neurons regulate communication between the nervous system and the voluntary muscles. Typically, ALS is a rapidly progressive disorder and almost always fatal. Friedreich’s Ataxia– Friedreich’s ataxia is an inherited neurodegenerative disorder that results in muscle coordination problems that worsens over time. This disorder usually begins in childhood. Friedreich’s ataxia is caused by a mutation in the gene named frataxin, which functions in the mitochondria of the cell. The first symptom is usually difficulty walking. This ataxia worsens and slowly spreads to the arms and the trunk. Huntington’s Disease– Huntington’s is an inherited disorder that causes the progressive degeneration/death of neurons in the brain. Huntington’s typically results in movement (ataxia), cognitive (thinking) and psychiatric disorders. The faulty gene occurs on chromosome 4; and it is not well understood how the abnormal “huntingtin” (protein) causes the disease. Therapy helps some of Huntington’s symptoms but can’t prevent the neurological decline. Multiple Sclerosis– Multiple sclerosis leads to damage of the myelin sheath, the protective covering on some of our nerve cells. This damage slows down/blocks messages between the brain and the body. The damaged myelin sheath on neurons promotes visual, muscle, balance disturbances and memory problems. Many scientists believe that multiple sclerosis is an autoimmune disease. Parkinson’s disease– Parkinson’s start from the loss of dopamine-producing neurons in the substantia nigra region of the brain. Lewy bodies are found in these cells; they are denatured aggregates of the protein named alpha-synuclein. Formation of Lewy bodies promote neuronal cell dysfunction and death. Parkinson’s presents mostly as a movement disorder (rigidity, slowness of movement, postural instability, and resting tremor). Prion disease– Prions (proteinaceous infectious particle) are also called transmissible spongiform encephalopathies (TSE’s), which are rare degenerative brain disorders (they are acquired or genetic). Symptoms commonly include psychiatric problems, lack of coordination, and personality changes. Prion disorders progress rapidly and there are very limited treatment options. Spinocerebellar ataxia–Spinocerebellar ataxia is a genetic neurodegenerative disorder (with many different sub-types that have unique genetic and biochemical features) characterized by slowly progressive gait problems, reduced coordination of hands, speech, and eye movements. Therapy helps manage some symptoms of spinocerebellar ataxia but is unable to prevent the neurological decline. Spinal muscular atrophy- Spinal muscular atrophy is a genetic disease that promotes muscle weakness and wasting in the arms and legs of infants and children. Spinal muscular atrophy is caused by a loss of motor neurons in the brain stem and spinal cord. As the motor neurons die, the muscles weaken, and this affects walking, crawling, breathing, swallowing, and head and neck control. The symptoms of spinal muscular atrophy span from mild to severe. 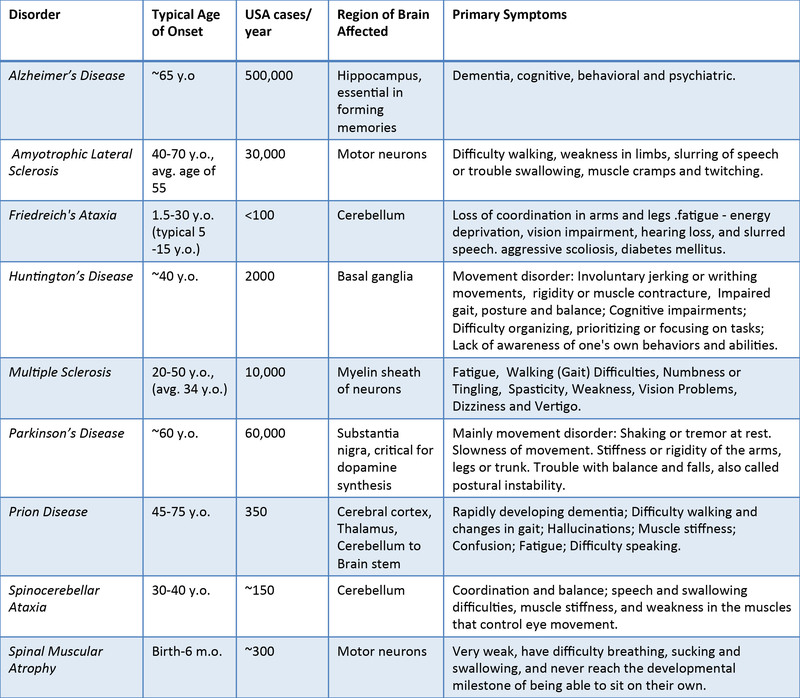 Comparison of these neurodegenerative disorders (see Table below): The table gives an overview of these neurodegenerative disorders with regard to age of onset, cases per year in the USA, area of brain altered, and the primary symptoms. This comparison highlights a number of differences, yet these diseases are unified by their neurodegenerative dysfunction. The many symptoms from each disorder illustrates the amazing importance of the brain and nervous system in the physiological functioning of the human body. Based on the total numbers of cases per year in the USA, Alzheimer’s and Parkinson’s receive a lot of attention and the largest pool of research funds from the NIH. However, to anyone with one of the above-mentioned disorders, they are all important regardless of number of patients/year. As we advance our understanding of one neurodegenerative disorder, we bolster all of them; laying future groundwork for new and novel treatment strategies. Please remain hopeful, persistent and courageous.